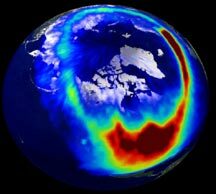 You will recall that the electrons that create auroras seem to travel along the earth's magnetic field lines. (For a refresher on the earth's magnetic field, review What makes them happen?) The earth's magnetic field is a modified bar magnet. The field lines become very crowded together at the north and south magnetic poles. Also, field lines are distributed fairly evenly around any small circle centered at the nearest magnetic pole. The electrons that create auroras start in the outer layers of the field, where it is compressed by the solar wind. They accelerate along the field lines, converging toward the magnetic poles from all directions. This results in an oval ring around each magnetic pole where auroras occur. 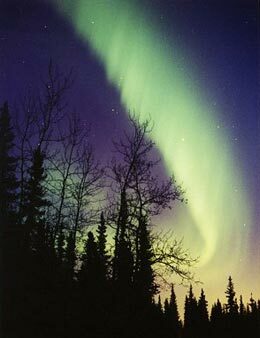 The north pole aurora is called the aurora borealis and the aurora at the south pole is called the aurora australis. Depending on the level of recent solar activity, there may or may not be visible auroral activity all the way around the ring. Where Can You See Auroras? Listen to David Stern of NASA's Goddard Space Flight Center. To Listen to this clip you will need the RealAudio player. So the best places to see auroras are near the magnetic poles. These include areas of northern Greenland, the Scandinavian coast, Siberia (brrr! ), and Alaska in the north, and Antarctica in the south. But when planning your trip remember: places above the arctic circle have round-the-clock sunlight during about April to September! This can make aurora viewing difficult. And the aurora australis might be observed by many penguins from May to September, but even scientists do not go out much during the Antarctic winter! Sometimes an extremely violent solar flare or CME sends a large burst of very fast, high-energy particles toward the Earth. Then the Earth's field is squeezed so hard even electrons near the center of the magnetotail feel the resulting voltage. These electrons follow field lines that arrive at the ionosphere farther south in the northern hemisphere, and farther north in the southern hemisphere. They can make a much wider auroral ring, or cause a large bulge on the night side, so that people in more populated areas nearer the equator may see an aurora every few years or once a decade. More energetic solar particles mean a larger auroral ring that can be seen at lower latitudes. So when there is unusually high activity on the Sun, the region of auroral activity on Earth becomes wider, and there is a chance of seeing auroras at lower latitudes, where most people live. Where might you be able to see auroras on a night like this? This picture shows the north auroral oval during a major geomagnetic substorm on July 15, 2000, when the Sun was nearing the maximum in its 11-year activity cycle. Can you tell where the biggest auroras are? Look carefully, and you'll notice that Greenland and the top of North America are completely inside the oval. 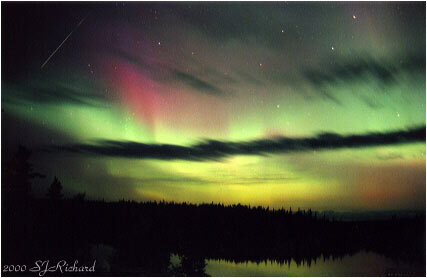 Here is beautiful aurora picture from Ontario, in eastern Canada. It was taken during another substorm, just a few days earlier. This is on roughly the same latitude as New England in the United States. And this picture, even more recent, comes from Mount Wilson observatory in southern California during the arrival of a major geomagnetic substorm on March 31st, 2001. See the NOAA POES satellite site for daily images and descriptions. If you would like to see today's auroral forecast, visit the University of Alaska's Geophysical Institute. See if there are any auroras near you! Aurora viewing tips from NOAA'a Space Environment Center.